Founded in 1985, the Alaska Pioneer Fruit Growers Association became a 501(c)(5) Non Profit Corporation in 1994. Any person(s) or family interested in the objectives of the Association and who pays membership dues can become a member. We have monthly meetings, annual grafting and pruning workshops in the spring, orchard tours during the summer months, apple tasting and apple cider pressing in the fall, and winter meetings. We also have occasional guest speakers. Many long time members and some of the original Pioneer Founders attend the meetings and are a valued treasure of information. We publish a newsletter approximately three times during the year. 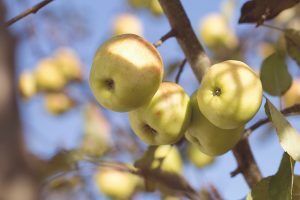 The APFGA encourages members to join the North American Fruit Explorers (NAFEX) a national organization, which publishes a quarterly magazine called Pomona.